Home / Index category / EUROPE TO FIND NEW CHAMPIONS: Gyor beat Buducnost for the final! EUROPE TO FIND NEW CHAMPIONS: Gyor beat Buducnost for the final! 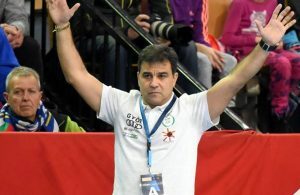 Eight seconds until the end, ŽRK Budućnost had a time-out and attack 7 on 6, but pressing on Cristina Neagu resulted with bad pass to Milena Raičević, which was a start of a big Gyori celebration at “Papl Laszlo Arena” in Budapest. At the end, Gyor beat ex champions 21:20 (11:8) after big battle, but just an average match full of technical mistakes. Montenegrian girls had to chances to score for extra-time in the last minute, but 50 seconds before the final whistle Radmila Petrović missed the whole goal ahead of classy Norwegian goalkeeper Grimsbo, who was one of the heroes of the “green team”, who had a noisy support by the numerous number of fans. The best part of the game for defeat team was the start of the second half, when Dragan Adžić girls made 4:0 series to turnover – 8:11 to 12:11, but Gyor’s defense found the balance and got back in control of the match.